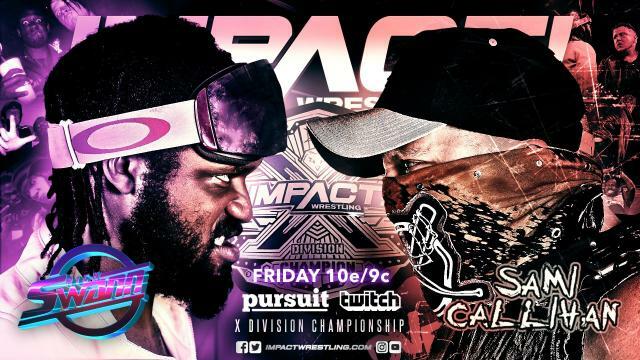 Good evening Fight Fans, and welcome to our coverage of tonight's edition of IMPACT Wrestling on the Pursuit Network and Twitch TV! We hope you enjoy the show and have a great weekend! Moose counters two huricanrrana before Trey hits it on the third attempt and sends Moose out of the ring before Moose catches him with a forearm when he goes for a rope. Trey hits a baseball slide and sends Moose over the top rope before hitting a suicide dive and goes for a flipping senton, but Moose catches him. Moose powerbombs Trey onto the apron and Trey superkicks him from the apron before Moose slings him into the ring steps. Back in the ring Moose beats on Trey before he comes back with a frankensteiner and a cheeky nandos. Trey hits a missile dropkick and a flipping senton before rolling him back into the ring and hits a frog splash for a surprising one count. Moose then hits a pop-up powerbomb for a near fall before Trey hits a reverse huricanrrana for a near fall and Moose spears him for the pin and the win. Winner: Moose defeats Trey via pinfall with a spear. Bahh and Eli start the match off by locking up before Bahh drops Eli with a shoulder block and falls on top of him when Eli goes to suplex him. Bahh takes Eli down and does a gator roll before tagging in KM who Eli turns the tables on and tags Eddie in. Eddie and Eli wring the arm of KM and tag in and out several times before Eddie hits a diving ax handle and Bahh comes back in with a running cross body. KM hits a slingshot splash before Eddie and Eli takes out Bahh and Eli hits a superplex before Bahh hits a running cross body. Eddie then grabs Kenny and tosses it to Eli who hits KM and Eddie pins him for the win. Winner: Eddie Edwards & Eli Drake defeat KM & Fallah Bahh when Eddie pins KM.